Djabe released two albums with Steve Hackett, in 2017, at the Cherry Red Records Esoteric Antenna of England. The album Summer Storms (CD+DVD format), containing the 2011 Bratislav concert, became one of the record label’s global bestseller in 2017. The studio album Life Is A Journey, released in October 2017, also achieved outstanding success, with very positive feedback from both the audience and professional critics. The guitarist of Genesis and the no.1 Hungarian Jazz/World fusion band are to release their 3rd album under 1 year, 15th February 2018. Djabe’s new live album features Steve Hackett (guitarist from Genesis) and Gulli Briem (drummer of Mezzoforte). The line-up toured through Hungary, Slovakia, Austria and the Czech Republic during June 2017. This edition, available in Digipak, contains one CD and one DVD. 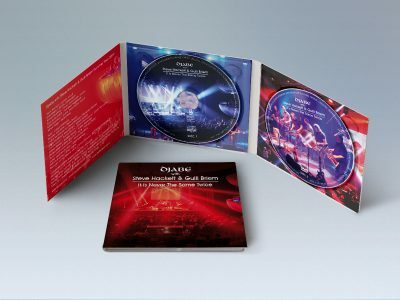 The CD recorded at Miskolc, Hungary, the closing gig of the summer tour. The DVD contains recordings of the concert at the Budapest Jazz Club, Hungary. Gigs feature compositions from Djabe, Steve Hackett, Genesis and Gulli Briem. These unique gigs profoundly charmed the audience, once again.